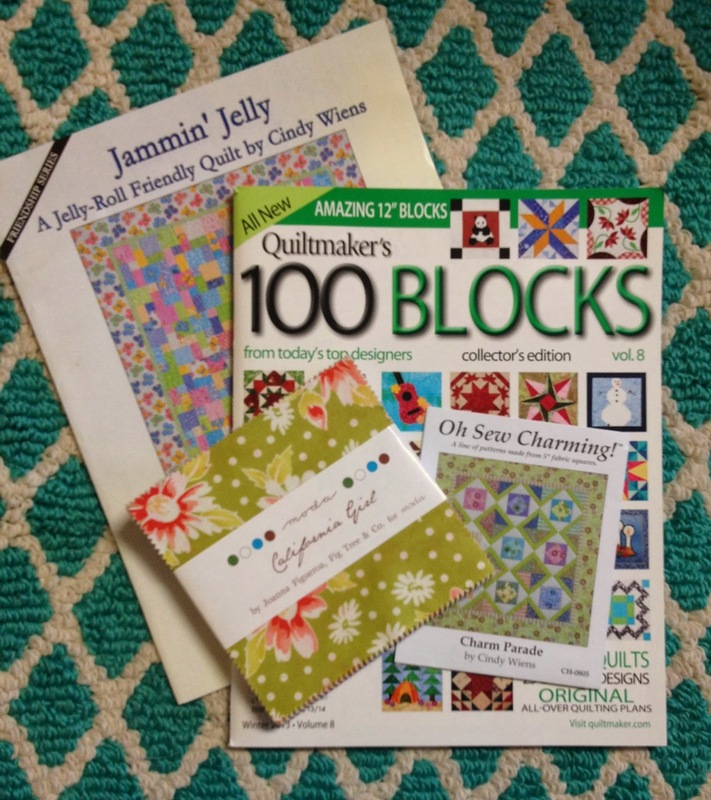 Live a Colorful Life: Patterns and Charm Pack--It's SMS Giveaway Day! The giveaway is now closed. Thanks to everyone who stopped by! Welcome to Live a Colorful Life. It's Sew Mama Sew's Giveaway Day and I'm so happy you stopped by. Included in the giveaway are two patterns designed by me, the latest issue of Quiltmaker's 100 Blocks (which includes one of my blocks), and a charm pack of California Girl by Joanna Figueroa for Fig Tree and Co. (because I'm a girl from California). For a chance to win the giveaway, leave a comment letting me know if you have a special holiday tradition. If you are follower, leave another comment for a second chance. All readers are welcome. The giveaway ends on Friday, December 13, at 5 p.m. PST. Be sure to check out all the other fabulous giveaways (supplies) here (handmade items). Thanks for stopping by and I hope you will stop by again. Hi! I live in Villa Carlos Paz, Argentina, over here it's summer, so it's a must make a homemade Fresh Fruit Salad. Anyway, I ♥ making cookies. Best wishes! Each year around Christmas, I take my niece ice skating. On Christmas morning we all gather around the tree for breakfast and a game of throwing wadded up wrapping paper at one another. Lots of fun memories. Thanks for the giveaway! I guess our holiday tradition is that we always travel. Even as a kid, my family always traveled. This year, though, we are going to my in-laws for the weekend before Christmas but are celebrating Christmas by ourselves, at home. I can't tell you how happy it makes me to say that. :) We're winging it on what sort of meal we're going to make and what activities we're going to do, but we live in Nashville, so there are plenty of options. Of course, my husband is on call (grrr!) so that may end up being a part of our tradition, too, but I'm trying to ignore that little gray cloud on my horizon. My hubbys family gets together on Christmas Eve. We only see some relatives once a year, so it's a really nice time. Thanks for the great giveaway! And I follow you via Feed Wrangler because it works so well with Mr. Reader for my iPad. Very similar to Google Reader, so I am quite happy my husband set it all up for me! Yay! Our special holiday tradition...every year I pick out an ornament for each of my kids that is some kind of memory for the year. If possible I write the year on it. My grandma did this when I was a kid and it is my favorite thing to buy the kids (now grown) all year! I am always on the lookout for the right ornament...sometimes all three kids get the same one, and sometimes it is unique to them and what they are into that year. This year I got each one a camel ornament to remind us that this year was the year of the hump day camel ads lol! I have two brothers and two sisters and we always get together for dinner on Christmas Eve with all the kids, grands and now great grands. On Christmas morning my husband makes cream chipped beef for breakfast while my daughter and I play with all the things Santa has left. We bake cookies and decorate and listen to Christmas music. We go to church on Christmas Eve and then open presents at my Grandpa's house! We like to sing Christmas carols on Christmas eve. We always watch National Lampoons Christmas Vacation! I made a Nativity Set that my children could play with when they were young. Every year, my son uses it to tell the Christmas story. He is now 26! No holiday traditions. I am usually so bushed from working on customer quilts I love to spend christmas on the sofa. Believe me, I am counting the days! I am a follower through email. Standing rib roast and Yorkshire pudding for Christmas Dinner is our tradition. We always have a lazy relaxed Christmas Day. Pajamas, breakfast and a day of movies! We always wear fun christmas pajamas to bed Christmas Eve! Baking cookies has always been my favorite tradition...tons and tons and batches and batches... all by the dozen!!!! Baking cookies, trimming the tree together...Christmas eve with grandparents and Christmas day at home. I like your soup and cookies idea. Thanks for the giveaway. We always have Chinese food on Christmas eve. This year we are doing Truth in the Tinsel with the kids! Hi there! Every year my daughters and I go into town and pick out a new ornament each. It's fun seeing how their taste have changed as they grow up. We gift each person a new ornament in their stocking every year! And I follow via feedly :-) Love your blog! We have a tradition for our Christmas Eve dinner. We always get a honeybaked ham and then my mom makes green beans, potatoes, etc. Yummy! Our tradition is to open one present on Christmas Eve and we bake and eat baked stuff on Christmas Eve. I am a follower through GFC and instagram. One of our favorite holiday traditions is attending the Boston Pops Christmas concert two nights before Christmas. Everyone gets dressed up, we have a nice dinner and then travel into the city for a lovely concert. A very special evening with the family. And I am a follower! Love your work!! One of our favorite traditions is star gazing on Christmas Eve! We go sledding Christmas Eve day. We have a cabin 15 miles from home so we sled and thenwarm up with hot chocolate and chili. By 2 we're ready to head home to finish up the last minute things for our Christmas Eve dinner and program. Thanks. My three sisters & I would help our Mom bake lots of Christmas cookies. I keep on that tradition of baking cookies to giveaway at Christmas. Thanks. how fun! i'm hoping to start the tradition this year of making myself, husband, and little boy christmas eve jammies. now i just have to get sewing! We put all our Christmas pillows on our beds! Those are the only "special celebration" pillows we own. Our family tradition is a large breakfast before we open gifts! Instead of leaving cookies for Santa we make gingerbread houses. I live in the very hot desert. However, it can get very cold in my opinion. My holiday tradition is being able to wear my pj bottoms without sweating. One family tradition if to attend Christmas Eve services at church and then coming home and playing games with the whole family. Cute! We have an end-of-the-holiday-season open house party called the Last Noel. We blast Christmas carols and invite all our friends, and it's something the kids and their friends look forward to all year. We decorate gingerbread houses. I glue gun them together and the kids decorate. Fortunately, they then are not edible and it really cuts down on houses falling apart.Fun for all ages. Your mice are cute. we devote the last saturday before christmas to decorating the tree! Home made cinnamon rolls on Christmas morning. A new tradition: in December I post a daily photo (facebook, instagram) of some part of my Christmas decor. Several of my friends are doing the same, and it's fun to appreciate the personal touches each one of us adds to the season. It's like an advent calendar! No, sorry we don't have a special holiday tradition! How sad! We put our tree up on December 18, we have a big party with pots of Chilli, Meatballs, and Pulled Pork, all served with a selection of Breads. We drink Hot Apple Cider and play silly games. Second childhood once a year. Oh yes I am a follower. We all get new PJ's on Christmas eve to sleep in! We don't have any special traditions, unless eating lots of food & having lots of fun are special traditions? Yeah, guess not. Thanks for the chance to win this lovely prize. I follow you via email subscription, thanks again! New pj's on Christmas eve, baking lots of cookies and celebrating Advent with a calendar, wreath and church activities. Thanks for the chance to win, we being from Argentina spend the holidays in the swimming pool! We have cookie Sunday with the kids and grandkids every year. A whole day of baking and take out pizza for dinner. I love it when all the presents are done and all the cards are written and posted and I can snuggle under a quilt with my Jack Russell and watch Christmas Movies with a sigh of relieve that I have finished for another year!!!!! We make lots of cookies and give them to family, friends and neighbors. The whole family with kids (and now grandkids) gather at my sister's house. Everyone contributes to the meal and she makes the Touchiere pies. It makes for a wonderful day! With family so far away, gathering is about all we can muster. We would love to have others, but we sneak in what we can each year around travel plans. We ride to the mountains of NC to pick out our tree every year. We listen to our favorite Christmas CDs and have lunch a the same little restaurant. I follow with bloglovin from work. Both of our daughter live out of state now, so I'm just looking forward to time with them both at home. We always go see the amazing lights at the Mormon Tabernacle. We always dress up and go out for a nice Christmas Eve dinner and then drive around and look at all the pretty lights. Those cookies are adorable. We always have a buffet style dinner on Christmas Eve and act out the nativity. Thanks for the chance. I follow via my blogger dashboard. Thank you for a great giveaway. One of my favourite traditions is that every Monday night in December we gather as a family to watch a Christmas film and have special treats. We really don't have any traditions. Sad now that I think about it. Thanks for the opportunity to win! Nothing real special in the way of traditions, but we do try to view some of the Christmas lights folks put up. There are always some really pretty displays. Merry Christmas!! We all go and pick out a Christmas tree together! Love California girl! tradition;ynew jammies every christmas eve!! Shopping with my 3 daughters. Thanks for the opportunity. One tradition is that every son gets a new flashlight (we try to find a different kind every year!). They must have 30 flashlights sitting around somewhere! We also go to a movie! I wear my christmas cracker hat upside down because that's what my Dad used to do when we were kids. We bake shortbread together using my grandmothers recipe. I am a follower and I love the California Girl fabric. On Christmas day we stay in our jammies and spend the day playing games. Thanks for the chance to win!! we always make from scratch Mexican food like mole, chile verde, enchiladas with slowcooked sauce, beans, tortillas, etc. My favorite tradition is the Fudge!! With my immediate family spread from the east coast to the west coast and to Hawaii, we do a new thing each year, or not! We don't really have any traditions. We just like spending time together. Those cookies are fabulous! We always do a chocolate advent calendar. Kids #1 and #2 are out of the house, but #3, who is 16, still insists on his chocolate! My immediate family exchanges Christmas gifts on Christmas Eve. No wishlists allowed, so it is always fun to see what everyone chooses for the others! When we make cookies, my hubby always uses the duck cookie cutter to create himself an "Army of Duckness" instead of christmas cookies. Our family tradition is a Fondue dinner at Christmas Eve, the only time a year I have Fondue. Thanks for the chance! I follow you on Bloglovin. Thanks for the extra chance! Every third year we spend Christmas in Kauai - I'm already looking forward to Christmas 2014! We always read the Christms Story every Christmas Eve. We get together Christmas Eve for appetizers and family gift exchange! Love it. We are developing little traditions with our own little family now - so fun. Thanks for the chance! We like to watch Elf and A Christmas story as a family. While growing up I remember that we would always go to my aunt's place on christmas day. Always, if not almost always. No special holiday traditions. Just enjoying the season and spending time with family. Enjoy yours! On Christmas Eve we light bayberry candles for luck and open small gifts under the advent tree! Thanks for the chance to win! I used to love making a gingerbread house, decorated with sweets with my children. They are grown up now, so we don't do it anymore. We always watch White Christmas. There is always grumbling at first, but then we all get enthralled. Thanks for the giveaway! My son and I watch Bing Crosby's White Christmas; it's a traditional started with my sister and mom, who are both gone now. My sister and I used to sing the "Sisters" song and laugh ourselves silly. I'm a follower in Sacramento! We all go to the midnight service on Christmas Eve at our local church then it's back home for mulled wine and mince pies! We have an Elf on the shelf that the girls love! We like to look at lights on Christmas eve, then come in for hot chocolate and a movie. The stillness of it all is what I love. casino buffet with my inlaws! We don't have any holiday traditions, unless always traveling to relatives for the holiday counts. what a fun tradition. I do have a tradition. Ever since we have lived in NC we drive to our mountains to a farm to pick out our Christmas tree. We have been doing it for 25 years. Our tradition is driving around looking at Christmas lights. We try to find new areas to look every year. I love your tradition, that's so sweet. We always decorate the tree as a family and re live some of the memories the ornaments bring from past vacations. For 30 years my husband has been reading the night before Christmas to our daughters. Still does whenever they are with us on Christmas Eve. Hilarity grows every year. Making gingerbread houses! Thanks for the chance! We make traditional meat pasties for Christmas Eve dinner. The other part of the tradition is new wind-up toys for everyone at the table. Every Christmas eve we get together with my husband's family at his oldest sister's home where we have stockings (I know, a day early!) and supper and visit, it is a lot of fun. We eat dessert and or dinner by candlelight the whole Christmas season. I am a follower. Thanks for sharing your inspiration. We don't really have any, I guess we need to start making some although the kids are already looking forward to leaving out biscuits for Father Christmas and carrots for the reindeers on Christmas Eve! Love your blog so I have been following for a bit now! We currently don't have any holiday traditions but are trying to think of some good ones to start! HELLO, trimming our tree+living room+front door; going caroling;baking+decorating cookies+exchanging gifts are our Christmas traditions! MERRY CHRISTMAS TO YOU! Homemade cinnamon rolls on Christmas morning. Wake up REALLY early on the 25th, cajole kids into eating breakfast really fast before opening the gifts! Love your cookies! We don't really have any tradition now. But we do enjoy Christmas! Be grateful and eat Chocolate Pie! I love decorating the house from top to bottom! I could probably open my own Christmas store! This is a lovely giveaway! I love to bake cookies! I am a happy follower :) Happy Thursday to you!